"They crossed over the border the hour before dawn ..."
The Nazi-Soviet pact was signed on August 23, 1939. In the pact an anti-communist Germany came to terms with the USSR to open an opportunity for the invasion of Poland. The Soviets, who could not negotiate an agreement with the British and/or French decided to protect themselves by dealing with the Nazis directly. The pact, signed in Moscow by Joachim von Ribbentrop and Vyacheslav Molotov, included nonaggression and trade agreements. World War II began within weeks with the German invasion of Poland. The pact was broken when the Germans invaded the USSR in June, 1941. "Most of our planes were destroyed on the ground where they lay ..."
On June 22, 1941 the German's launched their attack on Russia. The Russians admitted to the loss of 1,200 aircraft in the first 9 hours. Within a week 90 percent of the Soviet front line strength had been destroyed. At the start of the war Russian Aircraft were outdated and no match for the German's. They were later supplemented by British aircraft including Spitfires and Hurricanes, and also at least one American type (the P-39 Aircobra). They also designed new aircraft of their own (Yaks and MiGs). "Smolensk and Viasma soon fell ..."
Smolensk is a Russian city on the Dnieper River. The city was taken by the Germans during July and August of 1941. It became a central battlefield in the drive towards Moscow. Moscow was only 200 miles east of the city, along a road that had been taken by Napoleon in 1812. It was liberated by Russian troops in the winter of 1942-43. "By autumn we stood with our backs to the town of Orel ..."
Orel fell under German control October 8, 1941. German press chief Otto Dietrich told the world's leading newspapers "For all military purposes Soviet Russia is done with. The British dream of a two-front war is dead." His optimism was premature, to say the least. "General Guderian stands at the crest of the hill ...."
Heinz Guderian was a German military strategist who developed the Blitzkrieg, and was a primary proponent of tank warfare. He was made chief of German mobile troops in 1938. Guderian's tactics were extremely successful during the invasion of Poland (September 1938). The strategy was also pivotal during the German invasion of France in 1940. Guderian was put in charge of the German invasion of Russia, and was known for having many disagreements with Adolph Hitler with regards to strategy. "Winter brought with her the rains, oceans of mud filled the roads ..."
Guderian noted that it started to snow on October 6, and reported that it was STILL snowing on October 12. By November he was reporting severe cases of frostbite, and no sign of winter clothing from headquarters. 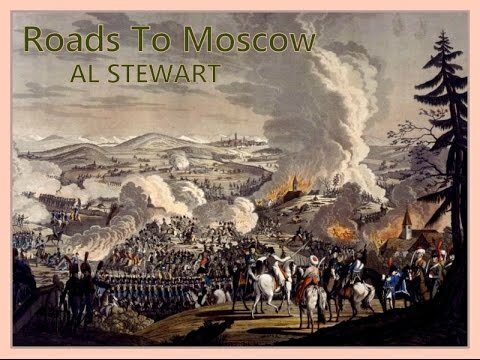 "In the footsteps of Napoleon the shadow figures stagger through the winter ..."
General Blumentritt wrote "With amazement and disappointment we discovered in late October and early November that the beaten Russians seemed quite unaware that as a military force they had almost ceased to exist." On December 4 Guderian noted that the Second Panzer Army's drive to Moscow had been halted. The temperature had fallen to 31 below zero, and this was causing the ill-prepared German troops hardships. On December 5 the temperature had fallen another 5 degrees. On December 6 General Georgi Zhukov unleashed 100 divisions of troops equipped and trained for the harsh conditions on the German invaders. For weeks afterwards the Germany army retreated, their front lines constantly pierced by Soviet troops. German military leaders could not help but compare their situation to that of Napoleon's defeated Grand Army, 130 years earlier. "Falling back before the gates of Moscow ..."
On December 5 the Germans had been stopped everywhere along a 200 mile semi-circular front around Moscow. By evening Guderian was notifying Bock that he had to pull back. Bock was telephoning Halder that his strength was at an end. Brauchitsch was telling his Chief of General Staff that he was quitting as Commander in Chief of the Army. "And the evening sings in a voice of amber..."
I ask you to indulge me here, but this image really gets to me. I'm first generation American from a Lithuanian background. Amber collected on the beaches paid my family's way to the US in two separate waves. It really IS much more significant to Baltic people then one might think. I'm not 100% certain Al was aware of the power of the image he created. Even less sure it can be explained. Amber, at first glance, looks and feels quite a bit like cheap yellow plastic. Held to the light, however, it has a rich inner glow. Hold it in the palm of your hand, and it quickly warms. It easily picks up a static charge when rubbed with cloth. It can carry away perspiration, and it is rumored that Chopin handled strings of it before a performance for just that reason. In English "amber" is used to describe both the fossilized tree resin and the most common color. In Polish there are 200 words used to describe the different types of amber. Amber has been carved by the Baltic peoples since neolithic times, and they ground it into folk medicines. Roman soldiers wore mail studded with amber, and the "jewel" helped open direct trade between Rome and the far north. in the Catherine Palace near Leningrad. In September 1941 German troops removed the panels and sent them by truck convoy and train to Konigsberg, a port city between Poland and Lithuania. In 1944 the RAF bombed the city for 2 days. No remains of the panels were found in the rubble, so it is believed they were moved before the attack. "The morning road leads to Stalingrad ..."
The Battle of Stalingrad was a pivotal Soviet victory. It stopped Germany's advance to the east. The German battle plan for 1942 moved away from Moscow towards the oil fields of the Caucasus and the warm water ports on the Caspian sea. In early July 90 divisions of German troops set out towards Stalingrad. The Germans crossed the Don on August 22-23, but were delayed in their advance by the Soviet 1st and 62nd Armies. By the end of September, however, the Germans had a foothold in Stalingrad. On November 23 a two-pronged Soviet counterattack surrounded the German 6th Army. Hitler forbade a German retreat, and declared that Stalingrad would become a "fortress", and would be supplied by air. Neither idea was feasible. General Erich von Manstein assembled a panzer corps in an attempt to relieve the 6th Army in Stalingrad. The corps drove north, but by November 19 was halted by the Soviet 2nd and 51st Armies 20 miles from Stalingrad. By this time the German 6th Army was in no condition to retreat in any case. The troops were frozen and starved, and their vehicles only had fuel for 20 miles. Germany held Stalingrad for another 6 weeks, until Field Marshall Friedreich von Paulus surrendered with his whole army on February 2, 1943. During the battle the 6th Army lost approximately 150,000 troops. Of the 91,000 Germans who became prisoners of war only a few returned to Germany. "Two broken Tigers on fire in the night ..."
The tank-to-tank battles of World War II resulted in intensive research and development in armored vehicles. Germany upgraded the designs of previously used tanks, and developed several new models. These included the Tiger (1942), the Panther (1943) and the Royal Tiger (1943). During the Russian push towards Berlin in the latter days of the war there were a number of massive tank battles, at times involving hundreds of Russian and German tanks. Eye witness accounts of some of these battles speak of the hulks of tanks burning like torches. "The flames of the Tigers are lighting the road to Berlin..."
In January 1945 the Russians mounted their greatest offensive of the war. Stalin sent 180 divisions, many heavily armored, into Poland and East Prussia. By January 27 East and West Prussia were cut off from the Reich, and Russian troops were only 100 miles from Berlin. Eisenhower informed Stalin on April 12 that US troops were going to make advances on Leipzig. Eisenhower believed that Hitler would make his last stand there, so that was where US efforts were centered. Berlin was to be left pretty much to the Soviets. Systematic bombing by Soviet and British forces reduced the city to rubble. The Luftwaffe, suffering from the depletion of its pilot corps and destruction of its airfields could not protect the city. On April 13, 1945 Russian troops had conquered Vienna. On April 16, Zhukov launched a final attack on Berlin. By the end of the month they had reached the center of the city. German civilians and troops, expecting revenge from the Soviets, rushed to surrender to American and British troops in the city. On April 25 patrols of the US 69th Infantry Division met with elements of the Russian 58th Guards Division at Torgau on the Elbe, cutting off Berlin. On April 26 Russian shells began falling on the Chancellery in Berlin. Hitler committed suicide in his bunker on April 30, 1945. The German surrender was signed on May 7, 1945. "And now they ask me of the time I was caught behind their lines and taken prisoner ..."
The Germans viewed captured Russians as slave labor, and they were treated very poorly. As German labor became scarce, they were forced to work in armament factories and mines. Some 5,750,000 Russians were taken prisoner during the war. Barely 1 million were found alive at the end. Two million died in captivity from starvation, exposure and disease. A million were released during the war, some of them to serve in collaborator units set up by the German Army. Another million were never accounted for. According to the Germans 67,000 were executed, although it is believed that the actual number is far higher. "They only held me for a day, a lucky break I say ...."
Russian prisoners of war who managed to escape their captors really did not fare much better. Fearing these men had been co-opted, Stalin ordered that they all be sent into a sort of internal exile in Siberia.